For a borough of its size, Homestead has had an inordinate impact on American history. Without being too nostalgic, the century of work at the Homestead Works mill site was a testament to the defining moments of American history from industrialization to organized labor to war to de-industrialization. Obviously Homestead has fallen on hard times since the end of the mill era but it is picking up slowly but surely with the economic engine of The Waterfront. However, this poor economic state does not excuse it from lacking a welcome sign entirely. West Homestead has one. Munhall has one. Duquesne has one. McKeesport has one. We decided to take a picture next to the most recognizable emblem of old Homestead, as pictured below. 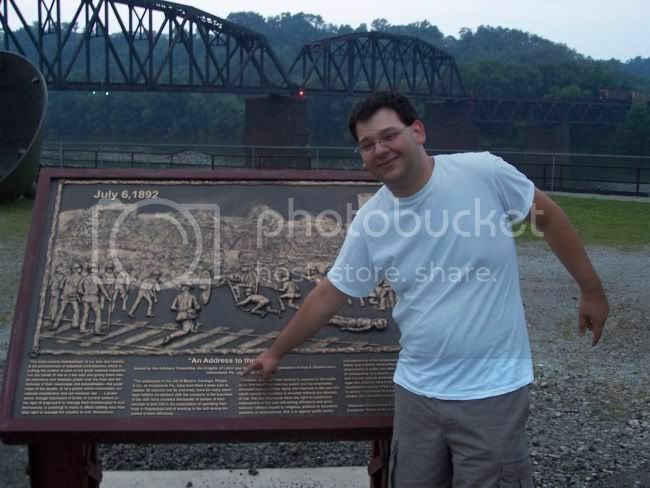 Though the site where this picture was taken is technically in Munhall, we think it passes muster. The "Battle of Homestead", one of the seminal events in American organized labor history is remembered in this depiction. If the battle occurred where this sign is placed, it is mislabeled - because we took this picture in Munhall.